Yesterday was bittersweet for more than 200 Cadbury employees, affectionately known as “the Cadbury family”. They have spent the past few months training with Competenz and Careerforce to ensure they have the skills for new jobs when the Dunedin factory closes early next year. And yesterday, 216 employees came together at the Dunedin Town Hall to celebrate and receive their level 2 or 3 New Zealand Certificates in food and beverage manufacturing, distribution, or cleaning services. 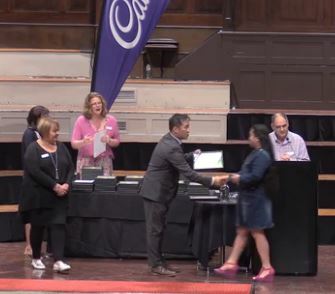 Careerforce Workplace Advisor Loi Lam congratulates Cadbury’s Cleaning Level 3 graduates at a ceremony in Dunedin. The graduates got into the spirit of the “Cadbury Graduation Ceremony” by filling the venue with purple lights, wearing purple clothing. Some dyed their hair purple. A small group made graduation caps from gold and purple chocolate wrapping paper. Fellow graduate Megan Fairley said the new qualifications had made them resilient and given them the confidence to go out and get a new job. She said she would miss her colleagues. “We are a big family because we probably spend more time together than we do with our own families. So today is a little bit bittersweet. It’s sad that it’s coming to an end. During the motivational ceremony, Mondelez International Dunedin site manager Judith Mair gave the workers a graduation pack, chock-a-block with goodies to help inspire them. Each received a copy of the Dr Seuss book Oh, the Places You’ll Go! During her speech, she quoted from the book. “Congratulations. Today is your day. You’re off to great places. You’re off and away. You have brains in your head, you have feet in your shoes. “That’s so true for all of us right now,” she said. The pack also included a pair of Cadbury socks (for walking in the direction you choose), a box of Cadbury Favourites (to sustain them on their journey), and a bottle of bubbly to celebrate their achievements. Ms Mair said production at the Dunedin factory was expected to ramp down from mid-December. The final production run was expected next March. This article originally appeared in the Otago Daily Times.